Dendritic cells, macrophages, and monocytes are a heterogenous population of myeloid innate immune cells characterized by phagocytic and antigen-presenting capacities. Phenotyping or enriching these cells via surface markers can be difficult due to the fact that several myeloid cells share similar markers, and different subsets or activation levels can feature distinct phenotypes. Moreover, it is often necessary to obtain myeloid cells from non-lymphoid tissues, which makes sample preparation challenging. 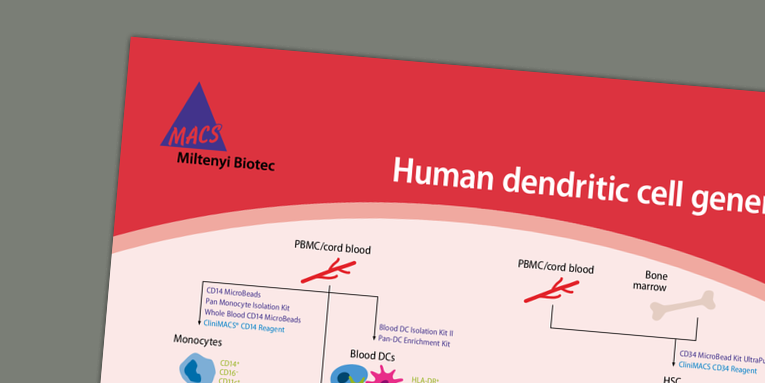 At Miltenyi Biotec we have optimized our combination of cell separation products, tissue dissociation kits, and highly specific antibodies to provide reliable and reproducible reagents for the investigation of myeloid cell subsets.